All mompreneurs need to be digital marketers. It is no longer a nice-to-have to know how to do marketing online, how to use social media and most important of all, how to plan out your internet marketing strategy. We are fortunate to have finally forged partnerships with one of the most active advocates of Digital education and providers of credible courses to professionalize the industry. iAcademy and the International Institute of Digital Marketing has partnered with Mompreneur Manila through its first event held last week, the DIGITAL MARKETING for MOMPRENEURS class held at The Crib. As announced at the event, our partners will be extending to all Mompreneur Manila members a super special discount on enrollment fees for the upcoming Social Media Marketing Plan module which starts on February 27. The internet is probably the best gift ever given to mompreneurs, whether home-based, SME or if you’ve been able to scale your business. Learn to use it well and have that extra push and edge to be able to reach your goals. This special offer is open to all our readers and mompreneur community as well as your referred friends. The more friends who join the bigger the discount on the program fee. Deadline for sign ups is on February 24 at 4pm. 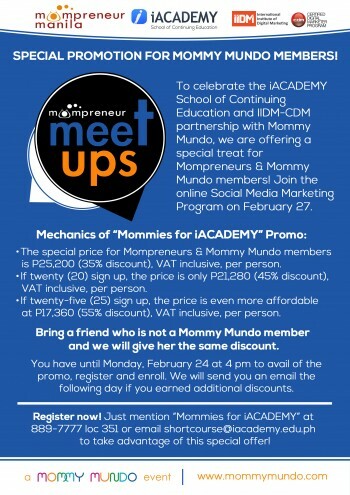 For any questions on this program and offer, feel free to email us at info@mompreneurmanila.com or shortcourse@iacademy.edu.ph. 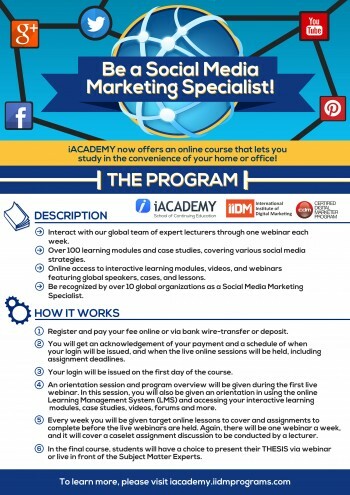 To know more about the programs of iAcademy, visit iacademy.iidmprograms.com.